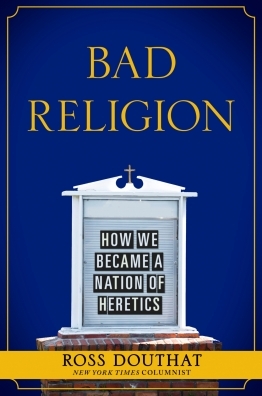 Douthat’s thesis is that, contrary to common assumptions, America’s problem is neither too little religion or too much religion, but it is, as the title says, bad religion. Where there was once a stable center of orthodox Christianity in American society, embodied and supported by traditional institutional churches, both Catholic and Protestant, there are now a whole host of sub-Christian beliefs and practices. As the subtitle says, we’ve become a nation of heretics. In the first part of the book, Douthat explains how this happened. In the years after World War II, a “mid-century revival” brought orthodox, institutional Christianity to prominence in American culture and politics (by “orthodox”, Douthat means the broad, historic Christian doctrine that all major branches of Christendom have professed – he defines it generally enough to include Protestants and Catholics). Though denominations differed from one another in many ways, they shared enough in common that Christian churches and leaders could speak and act in harmony in addressing American affairs, and do so in a way that transcended sectarian politics. But during the 60’s and 70’s, this Christian center or “theological convergence” began to break down with the result that Christian orthodoxy lost influence and stature in American culture. In its place rose all manner of heresies which are still gaining in strength while orthodoxy languishes. Douthat tackles these heresies one by one in the second part of the book. And he is at his best here. In chapter 5 he dismantles the latest “quest for the historical Jesus,” the risible but toxic ideas about Christ made popular in Dan Brown’s The Da Vinci Code. Douthat is also superb in breaking down the prosperity gospel in chapter 6. His analysis is deep, showing how even some preachers and churches that denounce “name it and claim it” theology still share its premises. In the next two chapters, Douthat takes on other heresies: the idea that we find god within ourselves, and the teaching that treats America as God’s chosen nation. Douthat is a keen observer and writes with an impressive mastery of the ideas and movements in today’s Christian landscape. His style is easy to read but dense in thought. And he is persuasive – he challenged the way I think about politics as a Christian, especially as he showed how conservatives as well as liberals can be guilty of assuming and promoting unbiblical ideas that then become unwittingly championed by Christians who should know better (e.g., read what he says about the utopianism lurking beneath Ronald Reagan’s vision of free-market capitalism, or his critique of Glen Beck’s misplaced “God and country” patriotism, both in chapter 8). An institutional and orthodox Christianity, such as the one I represent as the pastor of a Presbyterian church, may not be in fashion or what the world craves at this time. But Douthat makes an impressive case that this is just the sort of Christianity we need today. I highly recommend this book for all serious Christians who want to understand both the culture in which we live and the people of this culture who need the gospel of Jesus Christ – ultimately not to just make a better world, but to gain eternal life.